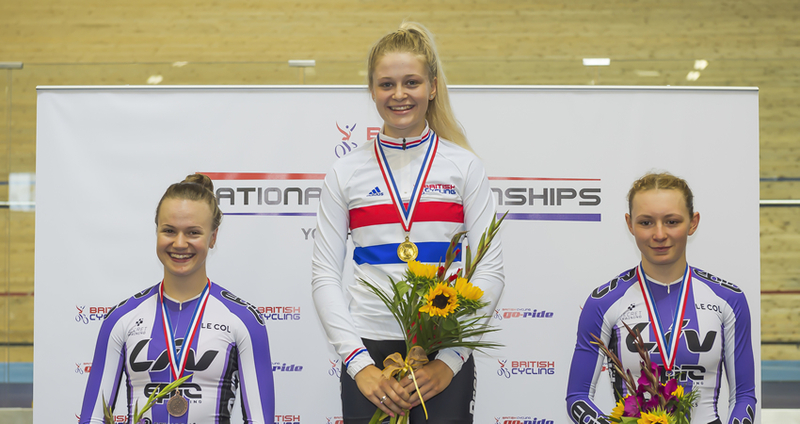 Eleanor Dickinson bounced back to win the British junior individual pursuit national title in a new personal best time just a week after a disappointing Junior Track World Championships. "I'm not the kind of person to give up easily so yeah I was knocked back after disappointing Worlds and Euros but I really wanted that time and national title so it was head up and onto the next," Dickinson said. "It put a smile back on my face for sure. I felt pretty happy again after that," she added after claiming her third track national title. "I knew I had done a 2:26 at Euros and Worlds but I really wanted to prove to myself I could do it at Derby and it wasn't just the fast environment that I was in at Euros and Worlds." At the World Championships a unlucky crash in the first round of the team pursuit for the GB team while overtaking Japan meant they missed making the bronze medal ride and would go on to finish fifth. With only a day to recover Dickinson prepared herself to get back on track for her main aim of finishing in the medal positions in the omnium. A strong showing in the opening five rounds including personal bests in the IP and 500m time trial where she finished second had Dickinson fourth, just two points from the podium. With the points race run and won Dickinson had slipped to fifth. "I guess I was just feeling really disappointed in myself I had trained hard and it was a big aim," Dickinson said of her result. In the first round of the team pursuit you were on track for a good time before a rider from Japan swung up as you were overtaking them causing Lauren Dolan to crash. You restarted but missed the bronze medal ride and finished fifth how disappointing was it to miss a chance at a medal? Yeah it was defiantly a scary moment, one of them things you know always could happen but you just never believe it will!! It was really gutting for us all, because like you say we were after a good time, probably the best we've done yet! But in the bigger picture, Lauren was ok and we rode again, which we were all really proud of. No matter the time, we got back up shortly after the crash and we didn't give in. You put in a strong opening five rounds in the omnium with a PB in the IP and second in the 500m TT were you happy with how the first five events went? I don't think so, they could have been stronger mostly the bunch races I think, there is a lot of room for improvement. The timed events yeah now I can look back and be proud of them. It's hard in that environment to be happy with a time that gets you sixth place in the IP, however now I can sit down look back and say I did a huge PB and I have improved so much within the year and that's all I can ask. To get second place in the 500 in the world, yeah I'm really proud of that. Started the final points race in fourth just two points off the podium how were you feeling ahead of the points race and what was your plan to move up on to the podium? I was happy with the position I was going into the points race in, but it was all so close around the top, anything could happen. I knew it was going to be a struggle, I'm not the best at a points race it's something I never really have got right! My aim was to try and get a lap. Again something I've never managed to do I wanted to go big on the points to get myself back up there. Finished fifth how did the final points race play out for you? Incredibly hard! There were people going for laps from the gun, I very much had my head down from the off. My legs felt rubbish, I committed to one big move to get a lap, we got close it was a perfect group as none of the top three were with me, but we never made the catch and after that I was hanging on, slipping down on the board and I think by then my head had gone. After the race you tweeted "Gutted doesn't come close to how I feel. Hardest 100 laps I've ever ridden to end my omnium. Head down from lap 1. Again my best isn't enough." How were you feeling after the race what was going through your mind? Yeah, that's exactly what happened! Head down from lap one, throughout the whole thing I gave it everything I never held back once. I guess I was just feeling really disappointed in myself I had trained hard and it was a big aim. You were incredibly disappointed after the race now a few weeks on how do you feel knowing you gave it your all? Do you think you have come through it stronger? Still pretty gutted! I don't think I'm ever going to be happy with the place but I'm happy that I left everything out on the track and that's all I can do. I'm excited and focused to train hard for this last part of my season on the road, go out there and give it my all again! Then prepare myself for a big winter ahead. You had a few days off the week after Worlds how important was that in allowing you to process it and refocus and look to your next goals with Nationals the next week? I defiantly needed it! Just a bit of time to refresh briefly before trying to focus again on something that I've been disappointed with. What were your goals for Nationals? I headed into nationals pretty tired, I didn't really know what to expect. My main goal was the IP because that's an event I've really worked hard to improve this year. Claimed bronze on the opening day in the 500m time trial did that give you confidence for the rest of the week? I do love a 500 and it's always something I look forward too. Probably because there is no pressure on me for a result but at the same time I push myself more and more every time I ride one just to see if I can get faster! It's quick and punchy and just lets me get everything out on the track! Set a new personal best on route to the national title in the individual pursuit what did it mean to you? Even more special following quickly on from disappointment at Junior Worlds? It put a smile back on my face for sure. I felt pretty happy again after that! I knew I had done a 2:26 at Euros and Worlds but I really wanted to prove to myself I could do it at Derby and it wasn't just the fast environment that I was in at Euros and Worlds. I was really focused to stay on the schedule and both my rides actually where a lot close to my schedule than any of my rides at worlds and euros. I was pretty shocked! Had been a bit disappointed with your IP times did it feel like you had a point to prove in the IP at Nationals? A point to prove to myself really! A couple of years ago or even last year, in fact early on this year I would have never imagined I would be able to be in a medal position in the IP never mind take a national title and a time of 2:26.2! I'm not the kind of person to give up easily so yeah I was knocked back after disappointing Worlds and Euros but I really wanted that time and national title so it was head up and onto the next. Finished your final track event as a junior with a national title to go with European Championship medals are you happy with how the past two years have gone? I started riding my bike on the grass track at Carlisle every Monday with the dream of riding at major championships one day! I never thought as a junior I could get a silver and bronze European Champion medal, three national titles and fifth at the World Championships. So yeah I'm happy with the past few years and I'm learning every time I get on my bike! Back on to the road now what do you have coming up? Finally yes!!! Back out training on the road now. I have a block out racing in Belgium with GB then I will fly out to meet Drops in France for an exciting week in the Ardeche. After that it's the hope of being selected for the European Road Championships to end my season. I'm really looking forward to getting back out there with Drops, I've missed them all very much and am so grateful for their support through my track commitments! I'm SOOOOO happy to be back on my road bike!